this is a nice review I received from a stranger who grabbed a cassette from our submission box at Deep Thoughts JP. Hopefully more people will realize it's there... ed. 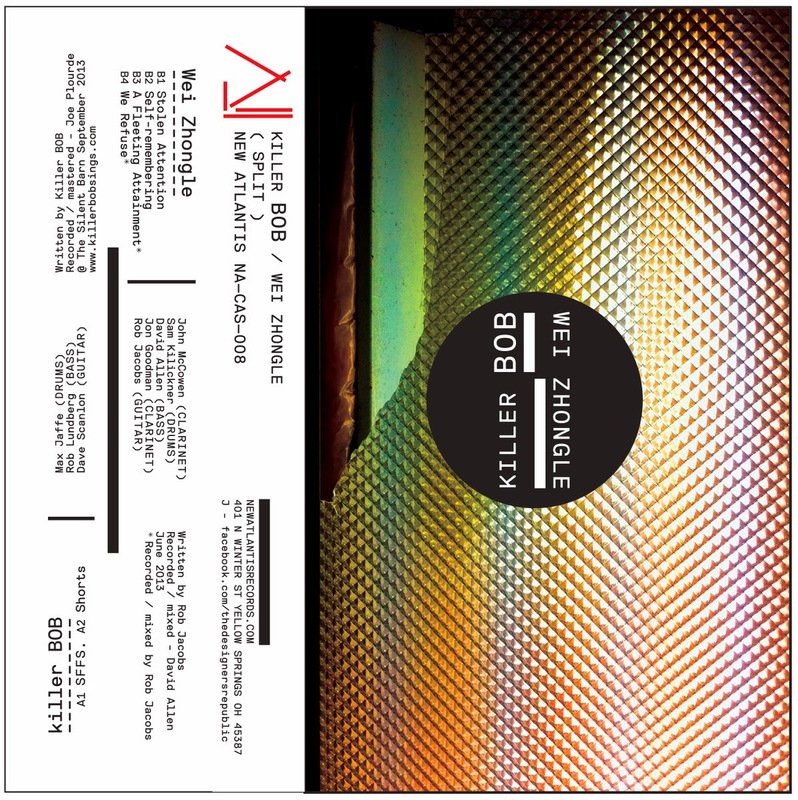 what is there to say about the killer BOB/wei zhongle split cassette released on New Atlantis that hasn’t already been said? what has been said about this tape? i would probably agree with anything said about this tape at this point as I’m so desperate for contact with someone else in this world who listens to this tape as often as i do. let me begin by telling you the circumstances in which the tape came into my possession. my band was on a two day stint in Massachuetts, playing a show in Hadley onOctober 24th at The Cedar Closet, and in Jamaica Plain at Walk Hill House on the 25th. The first night in Hadley was an evening of worry and anxiety. We fucked up planning and our third band member was almost stranded an hour away at the time the show was supposed to start. the several hours leading up to the show were a whirlwind of anxious phone calls and texts. we got to the show just as our opening act finished up with no time to talk or plan, just play. it ended up being a fun show and i felt positive about our playing. the forms might have gotten fucked up but the energy is there on both ends (band and audience). i recited a poem about defining one’s own reality. this will be important later in the review. the next day, we woke up and drove to boston. this was my first time coming to jamaica plain. (i bet you’re starting to realize where this is going). we got to the house we were playing at early and decided to go into town to get food and white hair dye (we had a strange idea to dye our hair white for these two shows but wimped out both times). on our way, our host Leo told us to check out Deep Thoughts. having just recently learned about the whole “boston scene” thing, i was intrigued. usually going to record stores isn’t exciting to me anymore, as most of the music i listen to is put out on smaller distribution labels that don’t get sold at record stores. Luckily this was exactly the record store i had in mind. the first thing i was confronted with upon entering the store was a rack of “free” cassettes”. the only catch is you had to write a review of said tape to have it for free. five months later, this is that review…. KB/WZ is a wonderful album, magical even. both sides feel like two completely different worlds/realities in which the music played is the music being broadcasted from the skies in said realities. maybe i should say it like this: listening to the music on this tape takes me to a place i have never been. what affected me most about the two sides is the confidence in which the music is presented. both bands are completely unapologetic and immersed in their own sounds. neither side has even a hint or self-effacing irony, which i think is a feat in today’s experimental music world. killer bob’s reality is gritty and disgusting (i use this term in the best possible way and often to describe kB’s sound). i want to use the term “industrial” without trivializing their music by comparing it to a tradition that they may not align themselves with. Max Jaffe’s drumming is robotic in it’s skilled repetition of phrases (i was not surprised when i found out KB met one another at the New School’s music program). Dave and Rob’s guitar and bass tone are unlike anything i have ever heard before or since. their sound is uniquely crafted at a level that any musician should strive to achieve. their compositions are well spaced-out, intricate and just volatile enough to keep listeners entertained and interested in what’s to come. Wei Zhongle’s reality is ethereal and delicate. their use of layering and repetition allows listeners to meditate on melodies and dissonant harmonies. the two clarinets are like cherubs flying around your head singing strange harmony lines. the song Self-Remembering sounds like traditional music from a culture far away. their heavier, distorted sections rock in a way that could only exist in relation to their previous statement of the theme of the piece (if that makes any sense). both albums sound like "traditional" music in that they might follow the teachings of some ancient, experimental covenant which crafted their sounds. the two covenants are not so different. they both embrace repetition as a form of meditation on musical themes. they are both beautiful even when not consonant. consonance had no place in killer bob’s covenant. this is the kind of tape you can put on, listen to straight through, and then listen straight through again. not only that, but you can do that several times a week. that’s just what i did when i got it. i had a small tape player by my bed and i listened to the tape straight through probably 15-20 times in two weeks. today seemed as good a time as any to finally write down how much i like this album. i lent the tape out in november of 2014 and just today ( april 2nd (it’s beautiful and sunny out)) i got the tape back. after being apart for over four months, listening to it felt like seeing an old friend.